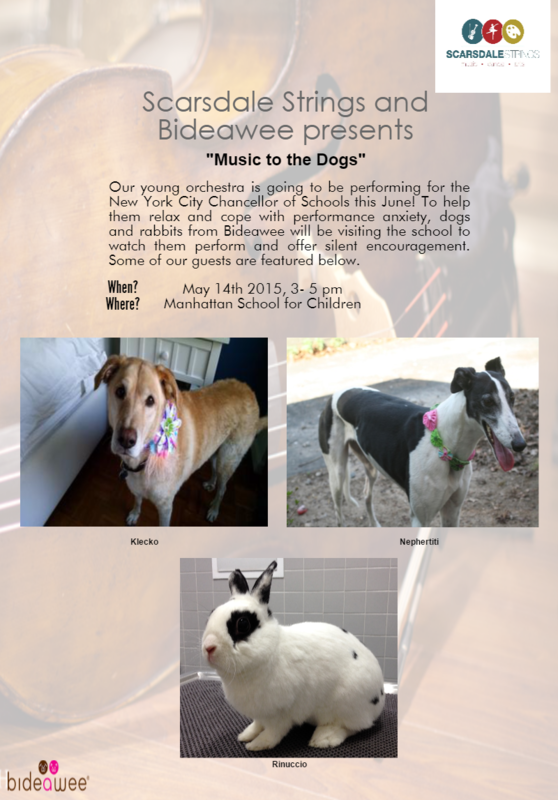 On May 14th, Scarsdale Strings is piloting the first ever ‘Music to the Dogs’ event with Bideawee at Manhattan School for Children. ‘Music to the Dogs’ is a unique modification to Bideawee’s existing program ‘Reading to the Dogs’ (RTD). RTD was conceptualized to enhance literacy by inviting children to read to canines since they are an inherently nonjudgmental audience. Scarsdale Strings has extended this program to create ‘Music to the Dogs’ for students who are first time performers and may be apprehensive about performing in front of a live audience. The students of the Manhattan School for Children will be performing as a part of the Scarsdale Strings District Orchestra at a Celebration of Learning event for the Chancellor and superintendents of New York City public schools this June. At our core we believe in linking creativity with service. We hope that through this program our students learn something about giving back. So we asked our volunteers the same question- what made them give their time through therapy dogs? Their stories are heartening. When Christine adopted a two year Labrador named Klecko, she instantly knew that Klecko’s silently observant disposition was ideal for a therapy dog. Klecko’s mere presence and gentle nudges with her wet nose helped an eight year old autistic patient come out of her shell. This made Christine think about the reason she joined the therapy team at Bideawee. It was because therapy dogs helped her own mother- a cancer patient-cope with her illness. Thomas Tulipan saw similar traits in his dog Nephertiti. He just knew that she had the makings of a therapy dog. Nephertiti, a lean canine who sports elegant flowered collars, is extremely patient. Thomas has a full house of canines and cats, but Nephertiti is the sole therapy dog. She is never insistent. Instead, she sits silently, being responsive and alert to the emotional nuances of those around her. This really resonated with Thomas who felt that more people should experience this kind of understanding. Maria Grieco pursues a slightly different path. She does not own a canine, but a musically inclined rabbit called Rinuccio. He was named after a pivotal character’s love interest from Gianni Schicchi, the third one-act opera in Il Trittico by Giacomo Puccini. Maria has seen Rinuccio have phenomenal effects on patients with limited mobility who willingly reach out, despite their pain, to pet him. He is a special addition to our list of animal attendees. In a result-driven society Scarsdale Strings wants to make sure that the process is just as engaging and motivating for our students. This unique program is being piloted by Scarsdale Strings at the Manhattan School for Children but will be instituted in our partner schools across New York City. A video of the event will be released shortly.